Popcorn | Dessert Darling , which kind of makes me mad at it. But can I fault a brand for concocting popcorn so addictive-ly delicious that I can’t put the bag down?? I’ve actually always found kettle corn to be supremely addictive by nature. With its hint of sweet and savory, it makes me dig through the bag in search of more flavor! POPS A LOT scratches your itch by adding a substantial amount of sugar and salt, thus yielding a more flavor-packed item than what you’d find at a street fair. For most people, this addition should be the satisfying touch that prevents them from downing the whole thing (..clearly, I’m not most people). I appreciate how fresh and crunchy this popcorn tastes. Furthermore, it’s made with 100% all natural ingredients, which is always a huge bonus in my book. POPS A LOT popcorn has a varity of tasty flavors, including a perfect caramel corn that you must try as well. In fact, I want to try all of these flavors!! This Thinny Thursday I’d like to feature my current obsession: Popcorn Indiana’s Kettle Corn. I discovered that Yummy.com delivers it to my door, and well, it was just game over from there. This Kettle Corn boasts the perfect balance of sweet, salty, and crunchy. With only 130 cals, 5 grams of fat, and even some fiber, Popcorn Indiana’s Kettle Corn is the perfect daily snack! 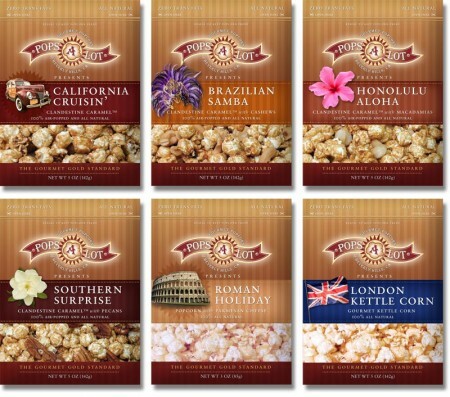 For more information on Popcorn Indiana- Kettle Corn, click here. It’s LAKERS season again which means back to the Staples Center for some basketball wins and mediocre “food”. Right when I grew hopeless about my dessert options, I discovered that they now sell Kettle Corn by Popcornopolis. Say what now?! I knew they sold caramel corn, and of course, the obligatory salted popcorn, but Kettle Corn now?! It’s a perfect marriage of slightly sweet and slightly salty and unlike the Caramel Corn that can make you feel like you have elves punching you in the belly, the Kettle Corn is light and fully edible. Nice! Furthermore, the Kettle Corn is made with only four simple and natural ingredients, a huge improvement from its caramel corn sister (which I’ve reviewed here). Plus, it has way less fat and calories! Woo, I just found my new staple treat at the Staples Center this NBA season! For more information on Popcornopolis, click here.